A large sample group of geometrically shaped stones were collected for analysis from the steep debris field on the collapsed western face of the Hummingbird Pyramid, and in the clear stream running below. The great variety of angular geometries expressed in the forms of the stones is most intriguing, and give the immediate impression of being shards of a giant, interlocking crystalline puzzle. Repeating patterns of crystalline angles often form square, rectangular, triangular and rhomboidal parallel faces that suggest distinct structural functions for different types. Flat stone plates with even thicknesses and long rectilinear plinths lay all about, protruding from the dark surface soils. Several examples of long, delicate stones perfectly formed as long triangular prisms were discovered (below), earning them the nickname 'toblerones' (after the chocolate brand sold in boxes of the same size and shape). Even more unusual and intriguing is the metallic composition of these geometrically shaped stones, which first became strikingly apparent when larger examples were lifted from the ground. Their stunning weight is far greater than natural columnar basalt, and the hardness and durability of these stones also appears to significantly exceed natural norms by ~15-25%, contributing to their very low water absorption. The unnatural metallic composition of the vast majority of the stones tested at several locations on the west and north sides of the Hummingbird Pyramid spectacularly indicates the man-made origin of the gigantic stone structure that appears to be a full refaçading of the rugged landscape. 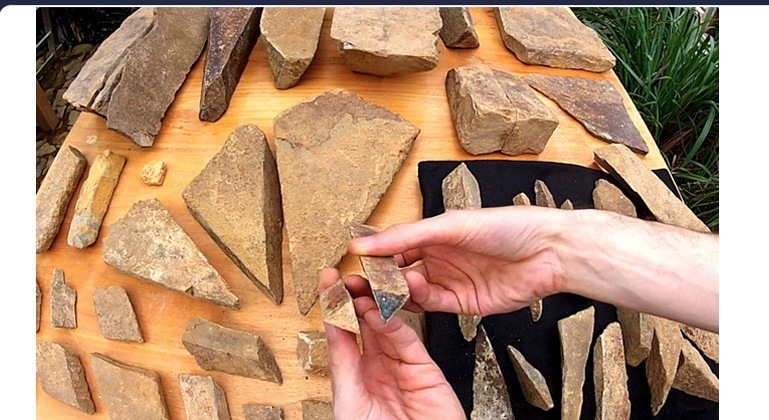 This astonishing reality aligns closely with the impressive archeological investigations simultaneously unfolding at the Padang Pyramid in West Java, Indonesia and the Valley of the Pyramids in Visoko, Bosnia. 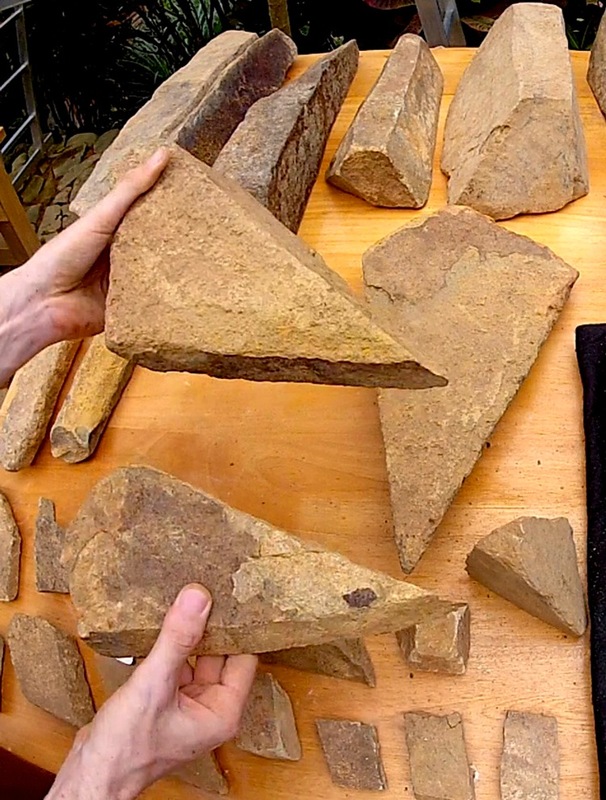 A wide variety of rectangular and trapezoidal blocks have been presented online in high-quality video format to effectively display their distinct geometric forms with specific surface features corresponding to ancient pavement stones (video stills, above and below). As demonstrated in the video, the act of striking these metallic stones together --even lightly-- generates a clear, resonant ringing tone. 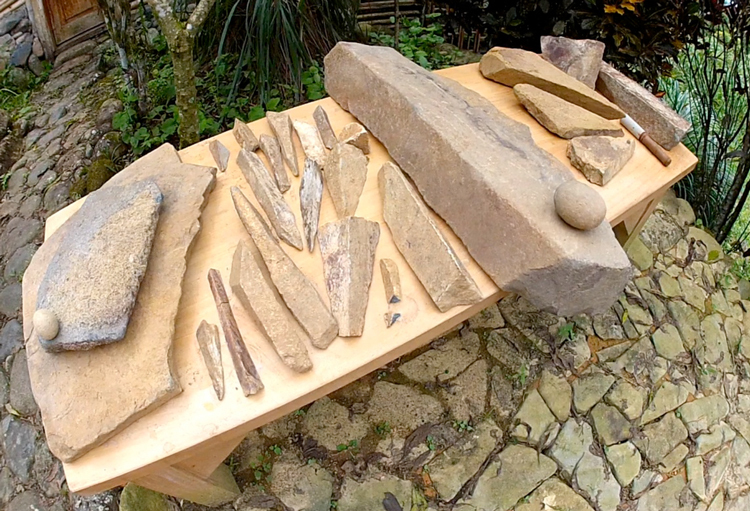 This same resonant effect of ancient stonework was known and widely utilized among ancestral musical traditions of indigenous communities throughout Southeast Asia, as well as by modern tourists to the Padang Pyramid, who often play these resonant stones with wooden mallets. The sonorous qualities of these synthetic basalt pyramid stones reveals their sophisticated resonant function, endowed by a special metallic composition that was painstakingly fabricated throughout the world during the Paleolithic era. At every known site where these types of artificial stones are found, amateur investigators are documenting compass deviations and magnetic vortices, yet no archeologists acknowledge this fact. Expert determinations regarding the artificial origin of this simple iron-rich cement produced by Paleolithic pyramid-builders at major sites distributed worldwide has been quietly acknowledged by archeologists, yet the same government-sponsored scientists continue to deny the synthetic origin of the pyramids' basalts. Another discovery of the petrological analysis is the finding of many microfissures, or microscopic cracks, in the thin section of andesite stone columns that appear non-natural because the cracks cut [across] the stone's constituent mineral crystals. The prevalence of microfissures within the pyramid andesites confirms they were artificially cast in rigid molds, the microfissures having been formed by slumping or settling patterns within the cold geopolymer slurry that are not present in natural volcanic basalts that fully crystallize while cooling from a molten state. In the sophisticated construction and maintenance of the Ohum pyramids of La Maná, Ecuador, these two synthetic geopolymer materials, metallic basalt and kaolin cement, have apparently been mixed together to produce an unusual heterogeneous stone/clay material. These samples possess significantly lower hardness and a much greater porosity, resulting in their high water permeability. These composite stone/clay blocks must have served a specific function within the pyramid structure. Broad sections of the ancient building constructed out of this material were most likely designed and used as giant seeps for absorbing all water flowing over or collecting on the surfaces of the pyramid, for diversion into water channels coursing deep within the pyramidal structure. Such seeps would also act as effective water filtration systems by trapping all suspended particles within the microporous cement itself, while also ionizing the water during its slow percolation through the stone/clay seep. After years of pondering on the unknown origin of magnetic properties among the many basalt and granite artifacts of the La Maná collection, multi-faceted blocks of all sizes recovered from excavations on the Hummingbird Pyramid were checked for magnetism using a neodymium magnet. Indeed, the Hummingbird Pyramid stones possess the same odd magnetic properties as the famous relics. 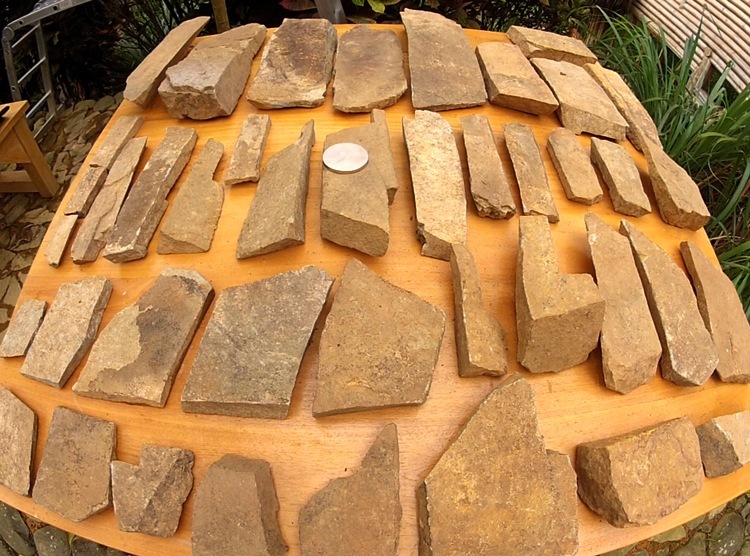 In fact, the majority of synthetic basalt paving stones, building blocks and casing stones possess anomalous magnetic properties that are not consistent with the great abundance of naturally formed basalts. 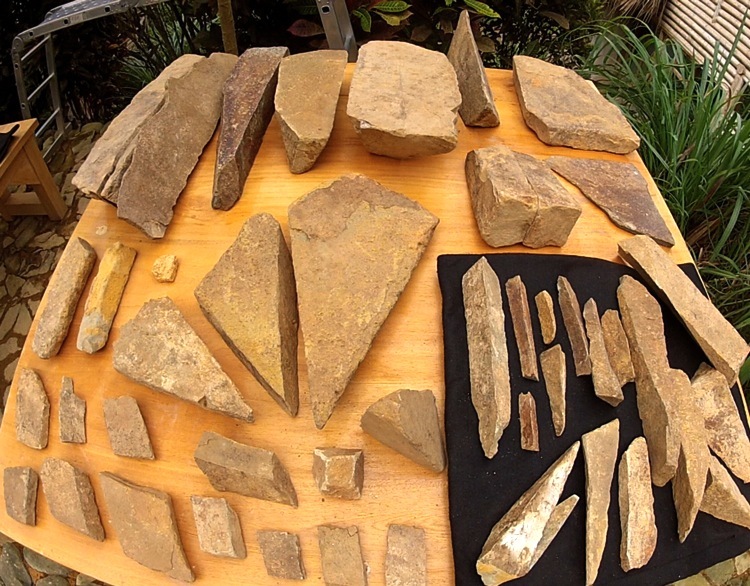 This challenging fact reflects that same unusual situation that has confounded archeologists and collectors alike, concerning the handcrafted stone artifacts found below the La Maná Pyramid. While all of the stones' originally molded surfaces bear a rusty orange appearance, exposed cross-sections of broken stones from the Hummingbird Pyramid show darker basalt surfaces flecked with visible metal particles (above). Fracturing of these artificial metallic stones tends to occur along flat planes through the stone, revealing an easily identifiable mineral component --iron pyrite-- evenly distributed as fine flakes throughout the basalt matrix. The rusty red coloration of portions of the stones also signifies the presence of powdered iron from ores processed in ancient times. 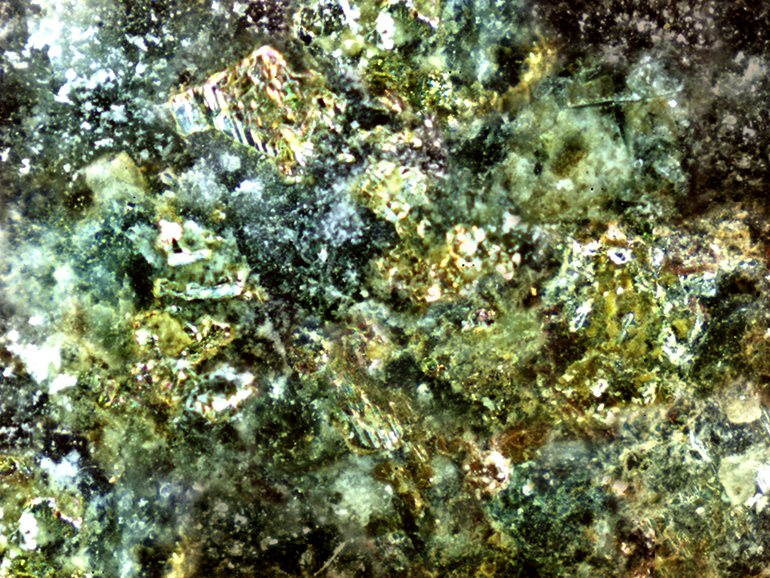 Preliminary measurements made with a Garrett Ace 150 metal detector have confirmed the presence of significant quantities of iron within the Hummingbird Pyramid's synthetic stones, but has also revealed the pervasive presence of another ferromagnetic element found in high concentrations in meteoritic material: nickel. As noted in the Bosnian Valley of the Pyramids, these accomplished Paleolithic builders often mined tunnel systems to connect their pyramids and provide the raw materials for their constructions above ground, selecting the most magnetic metals available in great abundance.